Charles Adler’s work on Kickstarter has had a profound effect on the worlds of art and design. His latest effort is Chicago-based makerspace Lost Arts. 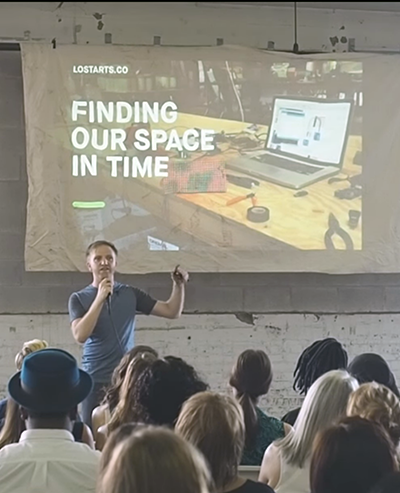 In June, Adler spoke at the 54th monthly gathering of the CreativeMornings Chapter in Chicago about his influences and where he finds himself, creatively. The grand stature and romantic stance of Adler’s opener reminded me of the cliché observation often made by speakers, whatever the discipline, when they affirm: “It’s a great time to be a designer.” “It’s a great time to be an artist.” “It’s a great time to be a teacher.” Etcetera. It’s a painfully obvious observation, mostly due to the fact that the speaker is alive and breathing in their age of possibility. Adler reinforced how great a time it is to be a creator, a maker. Cliché as this sounds, creativity is the reputation of human civilization, across the generations, from its birth to the present—to this moment. The reality it breeds is what Adler applauds and wants to keep flowing in the form of his new creation Lost Arts, located in the west side of Chicago. Tapping into the romantic vibe expressed by Adler, this makerspace is designed to be a sanctuary, formidably equipped with tools, and not exclusive to the digital kind. An open space and means to realize ideas—to ultimately dream and materialize a vision: an app, a film, a fashion collection, furniture, a robot, whatever. Adler’s Lost Arts persists and preserves his refrain of “This moment…”—this phenomenal act of creativity and commitment. This kind of moment is not unique to the present, not unique to the 21st century. “This moment…” is a nano-instance, an extremely tiny reality, an insignificant one throughout the miniscule timeline of human society. At the same time, “This moment…” looms large and audacious in the present tense. While Adler described his sensation of “This moment…”—again, this extraordinary act of imagination and allegiance—evolved in this current millennium, endowed with methods and tools of the current era and eras past, the first image that came to my mind were the cave paintings at Lascaux, 17,300 years ago. 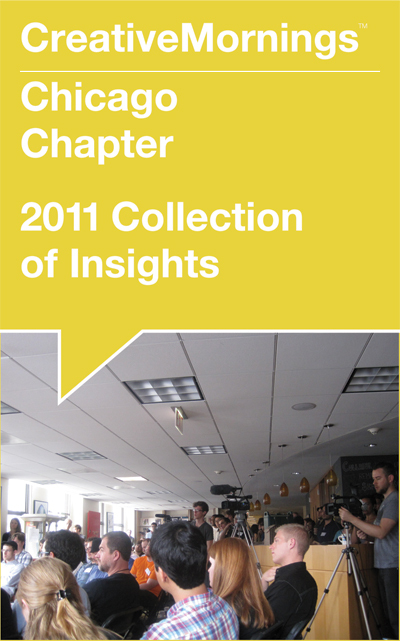 Fast forward to 2008 when Tina Roth Eisenberg, a.k.a. Swissmiss, launched CreativeMornings. What moments—those beautiful acts of creativity and passion—in human history (one’s history or that of our species, no matter the scope and scale), do you recall with ease and delight? Big thanks: to Braintree, Lost Arts (Host), Green Sheep Water, Lyft, for being Partners of Chicago CreativeMornings #54; to organizers Kim Knoll and Kyle Eertmoed who both spoke at Chicago CreativeMornings #7; to the team of volunteers for greatly helping to have CreativeMornings happen monthly in Chicago.